In this survey, we asked dentists about mouthguards and the PPM. Fully nine out of ten dentists surveyed believe mouthguards can improve athletic performance. That’s a claim made by the inventor of the Pure Power Mouthguard (PPM), a device designed with neuromuscular principles in mind. The goal of the PPM is to improve breathing (and therefore performance) by allowing the airways to relax. 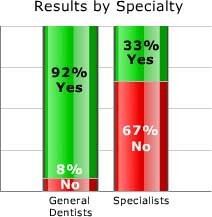 While general dentists are quite taken with the PPM, specialists are far less convinced. Of those who responded to this survey, only one in three said that a mouthguard can make you a better athlete. "The double-blind research studies are coming out, but you need to ask the athletes who are using them and have seen the increase in strength, flexibility and balance," said one general dentist. "Terrell Owens has actually been timed running faster with his PPM in." Every last one of the dentists who offer the Pure Power Mouthguard believe mouthguards can improve performance, and they offered rave reviews. “Absolute improvement! It's the science behind it,” said one. Among dentists who don’t sell the PPM, only three-quarters (77%) were convinced a mouthguard can make a better athlete. Note: Survey sample included 168 respondents.